I work quite regularly in London, and although I’m not a great fan of the underground, time usually dictates that I take those deep escalators into the depths of the earth, along with thousands of busy travellers, trying to get from A to B.
I find it great place to people watch and I do try not to stare but I love looking at the clothes people wear and try and imagine who they might be, where they are going to, or coming from. Are they going to work, tourists, friends out for a trip , nurses, brain surgeons, budding super stars, models, people going and coming from medical treatments, the whole world is represented down in these tunnels under the ground. Sadly, these days I also have to admit to a fear of rucksacks and their owners – a simple bag has become a threat and potential lethal weapon to my more vulnerable side. Last week, on one of those very hot sunny days I was sitting on a stifling tube in a deep tunnel, when it drew to a complete holt and just sat there in the darkness. I had not long been on the train and was still doing my quick scan to see who my fellow travellers were, when I heard heavy panting close by, it clearly wasn’t a person. Just to my right a few seats along was a large mongrel dog, struggling with the heat. It was bad enough in a summer dress, but to be wearing a thick fur coat as well seemed horrendous. The dog’s owners were trying to give him some water out of a bottle, but this is really not a natural talent for dogs and more was going down his front than down his throat. The dog owners were a young couple, dresses as punks, dark clothes, wild make up and a variety of tattoos and piercing decorated their bodies, when they stopped trying to give the dog a drink continued to kiss and cuddle ,lost in their own universe! This is not an unusual sight on a London tube but what was unusual was that the dog, large dog, was sitting comfortably on the seat, panting and slobbering on everything around it! It was interesting to notice how nobody challenged them and just let them get on with it, even though there was a general air of disapproval. With this distraction becoming boring everyone resumed their previous state of listening to music, reading the paper or staring into space. Tick,tick,tick,tick, the annoying base rhythm of the not so personal systems clearly audible, no melodies to make sense of the limited audible sounds. Just let it be, I tried to tell myself as the different base rhythms clashed and started to fry my sensitive musical brain! Other passengers were busy reading , chatting, tutting with stress and frustration and cursing the delay, and mostly trying to pass the time as best they could. 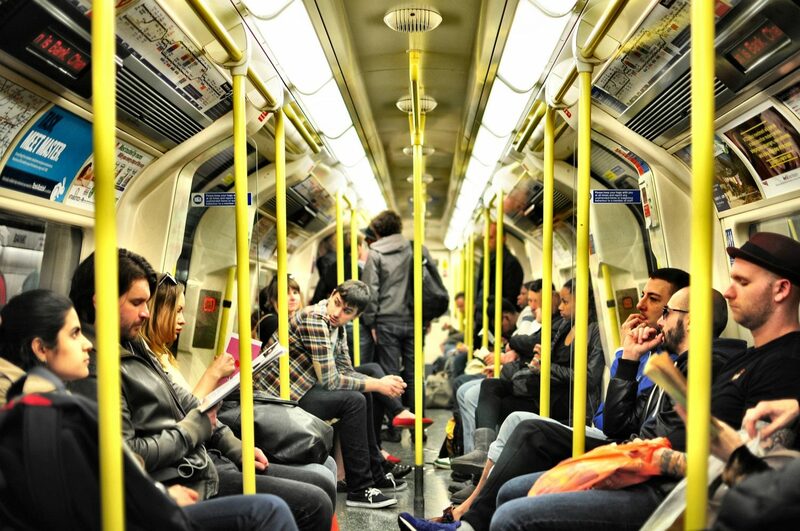 My thoughts drifted back to my student days, when there were smoking carriages on the trains. I remember, that in the rush hour, if they were the only carriages with space, I would reluctantly step inside the foggy capsule. The walls and windows were stained brown with smoke and nicotine, the velvet seats stank of the fumes that had been absorbed into the fabric, as did every piece of clothing and your skin and hair in a very short time. The lack of air was overwhelming and once released from this foggy den these smoky aromas would stay with you for the rest of the day, until everything could be washed and refreshed. At least this is no longer a reality and as I sat in the tunnel getting nowhere fast, I comforted myself that things could have been an awful lot worse and this distraction took some of the speed out of my building agitation. Time to practice what I preach, and find some quiet focus and awareness. Sometimes we need to make careful choices about what we choose to rest our awareness on. I took a deep breath in that warm muggy train and my eyes came to rest on the blue Oyster card in my hand. I looked at it carefully on all side, noticing its shape and size. I then began exploring the shiny, smooth surface with my fingers, it was quite a pleasant and calming feeling. I noticed the different blues and the white and the tiny black writing that I had never looked at before. I traced the word Oyster with the tip of my fingertips –“ wow, this little piece of plastic will never be the same again” I thought, as my focus was disturbed by the gentle change of engine noise and a slow forward sliding of the train. I looked up and realised I had stopped hearing the annoying headphones, stopped getting stress by rucksacks, could no longer smell the inevitable body odours of too many people in a small space, on a hot day! But best of all I had failed to notice how the couple with the dog were still there, but somewhat stressed themselves, as during one of their amorous exchanges, her nose ring had become tangled in his earing loops and they were stuck together in a very uncomfortable position, stuck very awkwardly together! The dog looked on, as did the rest of the passengers, trying hard not to giggle at their predicament, but too afraid to offer any assistance! Next stop was mine and I got off the train having had the most entertaining 15 mins ,that I wouldn’t have missed for the world.